This is episode number one of 2016!! What a way to start! Welcome one and all! On today’s show I had the fortunate pleasure of Interviewing two members of now not so all female (doom/sludge/stoner/what-ever else you wanna add on!) band shEver! Jesse (Guitar) + Alex (Vocals) join me in the withered hand hotseat to let me and all you know all about the past-present and (wobbly) future of the band. We talk of people who have come, people who have gone and people who get pissed off with you spilling their whisky! We hear how Chris is the only woman in the band! We talk about odd bands they have played with, small venues they have played in, the time they got asked to carry on playing even though they had such little material at the time! Belly dancing and of course City Of God..
All this and whole lot more, including selected cuts from the bands history. So strap yourself in, plonk on your headphones or press play through your computer and listen away! As always I hope you enjoy the show, Sorry for the no intro, Sometimes they happen, sometimes they don’t! Guess who’s back? back again? We are back!! Tell a friend! After a long hiatus the Withered Hand Podcast is back and back with a bang! 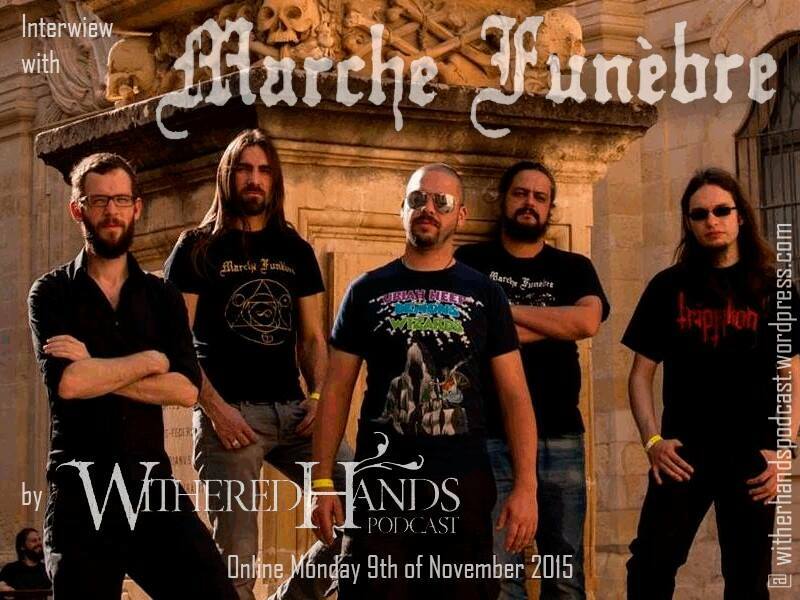 On today’s show we have special guest Arne from Belgium doom metallers Marche Funèbre. We get to grips with both the band and Arnes travels into the world of doom metal. The ups and the downs. The shows played, the albums made, the countries visited and the family they have acquired along the way! So sit back and enjoy the show! Support the band by heading over to any or all of the links below! So we are finally here!! The 3rd and final part of the trilogy of shows with Tom Phillips Of While Heaven Wept. On the last show we left you wondering why the conversation was cut off at such a crucial point. Well on today’s show all questions will be answered and we amp up the emotional aspect of interview. There was no better way to end the trilogy than the show we have for you today. So sit back and enjoy as we end this trilogy in style! Also head over to [http://whileheavenwept.bandcamp.com] to purchase all you While Heaven Wept merch. Money goes directly into the pockets of the artists, The way it should be. So if possible, Always choose this route! Hope you enjoy the show folks!! On today’s show we embark on the next chapter of the chat with Tom Phillips of While Heaven Wept. Not gonna do a long written piece today as I feel the show itself explains it all and I can promise you, this episode will leave you begging for the final part to be released as soon as possible!! The Withered Hand Podcast is on tour this time for this Hand Of Glory episode!! This episode chronicles the journey of one “Tom” as he embarked on a quest to the land of Ukraine to guest as a special musician for Narrow House in thier show at the Ukrainian Doom And Depression 2015 show on April 11th. You will hear tales of food, ice tea, rehearsal madness, words being pronouced wrong and a heathy dose of DOOM! so slip on your ear phones or speakers and crank this out. I Hope you enjoy this one folks!